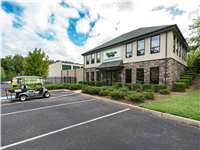 Located on Lovell Rd off Pellissippi Pkwy, Extra Space Storage serves Knoxville residents near Cedar Bluff, Hardin Valley, Farragut, Concord, Woodland Acres, and more. Locals will recognize our facility behind Phillips 66 and Nick & J's Cafe. Extra Space Storage on Lovell Rd can accommodate residential and commercial storage needs in Knoxville near Cedar Bluff with a variety of storage units, climate-controlled storage, vehicle storage, and more! With unit sizes from 5x5 to 15x30 and unit features like indoor access, first-floor access, and drive-up access, our Knoxville storage facility has the space to handle items large and small! To ensure the safety of our customers and their belongings, our Lovell Rd storage facility is equipped with advanced security features like 24-hour video surveillance and electronic gate access. Climate control maintains a storage environment between 55 and 80 degrees year-round to protect temperature-sensitive belongings from extreme heat and cold in Knoxville. Climate-controlled units are available in sizes 5x5 to 20x20. Need to store a vehicle in Knoxville? Extra Space Storage offers 10x20 to 15x30 enclosed drive-up units and 10x20 to 10x30 outdoor parking spaces to accommodate vehicles from motorcycles to RVs. At Extra Space Storage, we believe our customers deserve the best. That's why we maintain a clean, secure facility at all times, as well as why we employ a friendly, professional team that's dedicated to excellent customer service. We work hard to meet your unique needs and deliver a self storage solution you can count on. Contact us today to reserve a storage unit in Knoxville! I highly recommend Extra Space. The facility is ell kept, clean, and extremely well priced. The corporate and local staff were friendly and helpful. The experience was painless. I definitely recommend Extra Space Storage to friends and Family they were very helpful and understand my needs!! If you want a clean and professional storage company this is your company! Their team is top notch and locked in! Look forward to doing business with them. Thanks. I would recommend the extra space storage unit facility on Lovell Road here in Knoxville to anyone. For a clean facilities, friendly staff, tight security, and up-to-date accommodations, nobody can go wrong choosing extra space storage. I really like the storage location and the person that assisted us and helped us with getting in storage. Better lighting but overall , clean and great place to place your items. Location well maintained and security great. Friendly customer service. Clean storage units. Worth the monthly fee for the space and great location. I am very pleased so far. Would recommend if you are in need of extra space. Called and inspected other locations. None suited my needs like extra space storage. Clean facility and easy access. What impressed me most was how the on phone customer service reps took this call like it was the most important call they had. Very nice and attentive. The staff an extra storage was extremely helpful patient and kind during this process would highly recommend this storage facility. We moved to Knoxville and called several other storage spaces but no one returned our call except Extra Space Storage. They called us back immediately with a great price and great customer service. The unit is also easily accessible. I like the storage facility, but my rent has gone up three times in the year I've used Extra Space. I need to look for another facility. Great facility, great location, and even better employees! The manager Bryan was very helpful. They had the size I needed and was very clean. I would highly commend this facility. Be aware you have to buy a lock from them at $17.99 and there is an administration fee. Otherwise, it's very clean and well kept. I wasn't aware there was a move in truck available. Drive south on Pellissippi Pkwy. Pass Pellissippi State Community College and continue south on Pellissippi Pkwy. Take the Exit to head toward Lovell Rd. Turn left onto Lovell Rd. Take your first right. Our facility is directly behind Conoco and Nick & J’s Café. Drive northwest on Pellissippi Pkwy. Take the Exit heading toward Lovell Rd. Follow the Exit around and stay straight on Schaeffer Rd. Continue straight. Our facility is directly behind Conoco. Drive southwest on Ball Camp Pike. Continue straight onto Lovell Rd. Pass Sails Way and get in the left turn lane. Turn left toward Conoco. Our facility is directly behind the station and Nick & J’s Café. Drive northeast on Yarnell Rd. Turn left onto Lovell Rd. Turn right toward Nick & J’s Café. Our facility is directly behind Conoco, off Lovell Rd.